Vento di Terra NGO worked in Afghanistan between 2013 and 2015. Vento di Terra started working there agreeing with the Embassy in order to develop the experiences gained in Palestine with the construction of primary schools in bioclimatic architecture. VdT made its first project in the Governorate of Herat, supporting local silk processing and participating in an intervention that still involves 2000 women in a difficult situation. The security situation seemed worrisome, but it was possible to define an effective strategy through the collaboration of the Herat Embassy and UTL staff. The project had a great result and there were chances to expand the intervention in the country. Our partner demonstrated good skills, professionalism, reliability and in August 2014 it was possible to carry out an on-site seminar on natural silk dyeing, involving an Italian expert. The aim was to create the condition for workers to sell their products in the European fair-trade sector. Thanks to the collaboration of the Embassy, it was also possible to attend the fair-trade Fair of Ferrara in September. Dr. Ghafoori, President of the NGO RAADA (Rehabilitation Association and Agriculture Development for Afghanistan), participated in the fair. The scenario changed drastically the following year. Despite Italy’s commitment to support the Government of Ghani from and to maintain the military contingent, the UTL headquarters in Herat were closed. It is a huge compound, with a capacity of fifty beds, offices, equipment, armored vehicles, completed just a few years earlier. Co-operation was essentially dismantled, giving local communities a non-encouraging message about the prospects for international support. This attitude is unclear, given the billions of euros invested by our country since 2011 for military missions, and the delicate local context. This attitude has had consequences on the guidelines of the newly formed Italian Agency for Cooperation and Development. In 2016, Afghanistan appeared as a priority country and then it was cancelled for “security reasons” at the next stage. The NGOs operating in the country were placed in a less sustainable situation. They had sowed expectations among the beneficiaries, risking themselves to carry out the feasibility study, invested time and funds to submit the draft, and then find out that Afghanistan was no longer eligible. The most striking disappointment came from the Afghan side. Military presence without humanitarian intervention was likely to be perceived as pure occupation. Even if our country’s commitment remained valid, it was being challenged by demobilizing logistical structures and cooperation. In this mutated framework, VdT tried to follow the project developments on the field. They identified the promotion of Afghan products, the participation in industry fairs, the training of qualified personnel in Italy as tools to keep the cooperation alive. Thanks to an agreement with the Master in Cooperation of the University of Pavia, two Afghan students were able to compete for scholarships. In June 2016 Dr. Waheed Saghary was assigned one of the subsidies for the 2016-17 session and along with him, Abdullah Qambary, a Kabul student. 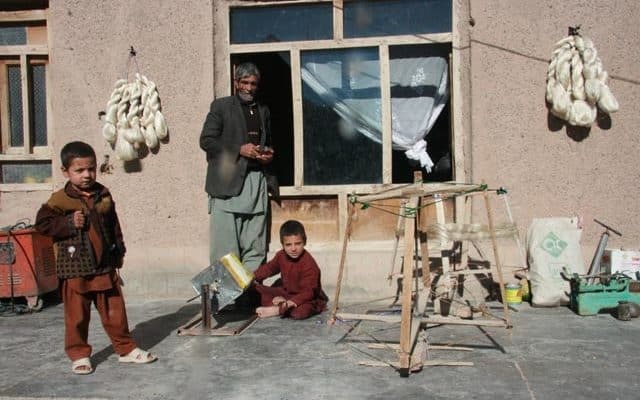 Waheed was a young and brilliant graduate of Herat University, who collaborated with VdT from 2013. He also followed the fieldwork with excellent results. With a presentation letter from VdT and the University of Pavia Dr. Saghari began the complex procedure for the visa application. It was necessary to prove the economic solidity of his family, to present a statement of responsibility on our part and fill infinite forms in Italian, activity in which he was assisted by our headquarters. each case carefully, but we have to take into consideration the general context. It was a surprising result, which invalidated months of work and showed that the involvement of Vento di Terra and the University of Pavia, and the potential of the training project were not kept in consideration. Dr. Saghari had been persuaded by us to follow the procedure, to cover costs, to pay for the flight and travel from Herat and finally to stop his professional activity for the ten days in the capital. Later, in the framework of a project funded by the British NGO Christian Aid, RAADA obtained a loan to develop the work started in Italy in 2014. The project included the management of a stand at the “Tuttaun’altracosa” Fair, in Milan, September 2017, and one mission in Italy for Dr. Nazir Ghafoori. After preparing the documents and defining the general programme, on June 22nd, a communication about the temporary suspension of visas appeared on the website of the Embassy of Kabul. (http://www.ambkabul.esteri.it/ambasciata_kabul/en/). In weeks later, the adjective “temporary” became more unlikely and we realized that the office in the capital had been closed. At this point, we think it is necessary to ask the Italian political world to give a clear answer about the future of our country’s intervention in Afghanistan. If you intend to leave the Afghans to theirs fate, expose it and the damage will be less than continue to fuel expectations and spend public money for a mission without prospects. If Italy is going to resume the path taken 16 years ago, it seems necessary to make it clear.